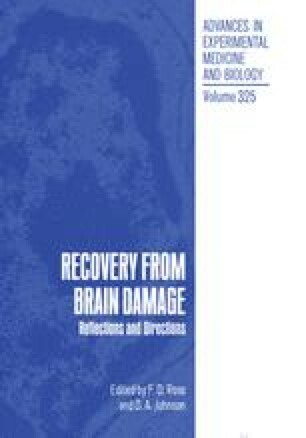 Perhaps the most perplexing and significant question facing neuropsychological investigations in the “Decade of the Brain” is the issue of how to repair the injured nervous system. This question is not only theoretically interesting but it also takes on particular importance for at least two practical and socially-relevant reasons. First, improvements in medical facilities and in safety devices, such as automobile seat belts, have led to a marked increase in the survival of people with head injuries. Thus, as we approach the twenty-first century there are increasing numbers of people who have sustained, and survived, significant brain damage. Indeed, it has been suggested that brain injuries may represent a “silent epidemic” of Western civilizations in which on the order of 0.25% of the population suffers a closed injury each year. This number is cumulative so that the chances of sustaining a closed head injury over a lifetime would be in the order of 1/20. This is a nontrivial social issue when we consider the billions of dollars needed for the treatment and maintenance of people with head injuries. Second, the proportion of the population that is living to old age is increasing and thus a greater proportion of the population can be expected to suffer diseases and other disorders related to the aging brain, including the normal degenerative process of aging.